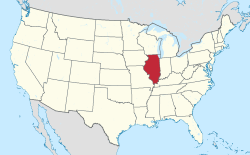 Cairo ( /ˈkɛəroʊ/ KAIR-oh)  is the southernmost city in the U.S. state of Illinois, and is the county seat of Alexander County. Several blocks in the town comprise the Cairo Historic District, listed on the National Register of Historic Places (NRHP). The Old Customs House is also on the NRHP. 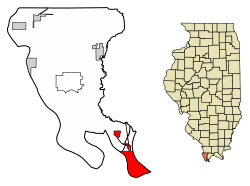 The city is part of the Cape Girardeau– Jackson, MO–IL Metropolitan Statistical Area. Being bypassed by transportation changes and industrial restructuring cost many jobs: the population at the 2010 census was 2,831. The city's peak population was 15,203 in 1920. Charles Dickens visited Cairo in 1842, and was unimpressed. The city would serve as his prototype for the nightmare City of Eden in his novel Martin Chuzzlewit. 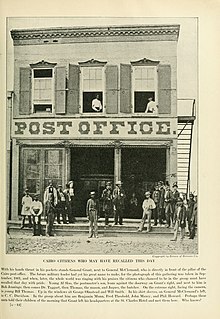 In 1846, 10,000 acres in Cairo were purchased by the trustees of the Cairo City Property Trust, a group of investors who planned to make it the terminus of the projected Illinois Central Railroad, which finally arrived there in 1855. In January 1862, during the Civil War, General Ulysses S. Grant occupied the city, and he and Admiral Andrew Hull Foote made it their headquarters. They had Fort Defiance constructed to protect the confluence. Cairo became an important Union supply base and training center for the remainder of the war. But Grant's military occupation caused much of the city's trade to be diverted by railroad to Chicago. Although blacks comprised a large proportion of the Cairo population, they were frequently discriminated against in jobs and housing. Race relations were strained in 1900. The state passed an anti-lynching law in 1905. On the night of November 11, 1909, two men were lynched. The first was William James, an African American accused of the murder of Anna Pelly, a young white woman killed three days earlier, although there was no physical or circumstantial evidence connecting him to the crime. The second man lynched was Henry Salzner, a white man who had allegedly murdered his wife the previous August. James was accused of killing Pelly by choking her to death in an alley with pieces of a flour sack on the evening of November 8, 1909. Pelly's body was discovered the next morning. Police believed that James was large enough to have committed the crime, especially as there were rumors of an accomplice. James was placed in police custody on Tuesday, where he remained until Wednesday evening. No physical evidence linked him to the crime. As word of the crime spread, whites in Cairo demanded an immediate trial of James, but the case was delayed by the court. The white townspeople grew infuriated by the delay in a speedy trial, and the threat of mob violence quickly developed. On November 10, Sheriff Frank E. Davis arranged to take James out of the city jail on an Illinois Central train to avoid mob violence. But the increasingly large mob in Cairo learned of this and seized another train, racing to catch up with the sheriff and James. Sheriff Davis' attempt to save James from the mob proved futile when the mob intercepted Davis and his prisoner. The mob returned James to Cairo and took him to the intersection of Commercial Avenue and Eighth Street. Approximately 10,000 people had gathered for a spectacle lynching as the leaders attempted to hang James from large steel arches that spanned the intersection. When the noose was placed around his neck, James confessed, "I killed her, but Alexander took the lead". [ citation needed] The rope broke and James survived the hanging, but members of the armed mob shot him more than 500 times, killing him. The mob dragged James' body to the scene of Pelly's murder. His head was cut from his body and displayed on a pole that was stuck into the ground, and his body was burned. In 1929, the Cairo Mississippi River Bridge was completed, linking Missouri with Illinois to the south of Cairo. In 1937 the Cairo Ohio River Bridge was completed. Completion of the two bridges ended the ferry industry in Cairo, putting many people out of work. As the town was bypassed by two bridges to the south, it also lost the benefit of motorist travel and trade between the states. 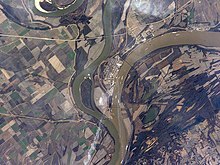 Motorists cross the southern tip of Illinois between Missouri and Kentucky by completely bypassing the city of Cairo. While the city was protected by its levees from destruction when the Ohio River rose to record heights during the 1937 flood, the city's economic decline continued. With the decline in river trade, as has been the case in many other cities on the Mississippi, Cairo has suffered a marked decline in its economy and population. Its highest population was 15,203 in 1920;  in 2010 it had 2,831 residents. As of the census  of 2000, there were 3,632 people, 1,561 households, and 900 families residing in the city. The population density was 515.1 people per square mile (198.9/km²). There were 1,885 housing units at an average density of 103.2 per km² (267.3 per sq mi). The racial makeup of the city was 35.93% white, 61.70% black or African American, 0.08% Native American, 0.72% Asian, 0.03% Pacific Islander, 0.36% from other races, and 1.18% from two or more races. Hispanic or Latino of any race were 0.74% of the population. Magnolia Manor is a postbellum manor, built by the Cairo businessman Charles A. Galigher in 1869. It is a 14-room red brick house which features double walls intended to keep out the city's famous dampness with their ten-inch airspaces. Inside the home are many original, 19th-century furnishings. It has been listed on the National Register of Historic Places since December 17, 1969. The house is operated as a Victorian period historic house museum by the Cairo Historical Association. Film-makers Jacob Cartwright and Nick Jordan's feature-length documentary Between Two Rivers (2012)  is about the social, economic and environmental problems faced by Cairo.